Lasting only eighteen minutes, the Battle of San Jacinto was the definitive ending to Mexico’s control of its northernmost province of Tejas y Coahuila and the birth of the Republic of Texas. Starting around four o’clock in the afternoon, General Sam Houston and the Texas Army led a surprise charge and defeated Mexican President and General Antonio Lopez de Santa Anna and his Army of Operations on April 21, 1836. As the short battle unfolded, a bullet struck General Houston in the left ankle. Meanwhile, Santa Anna, the self-proclaimed “Napoleon of the West,” disappeared. 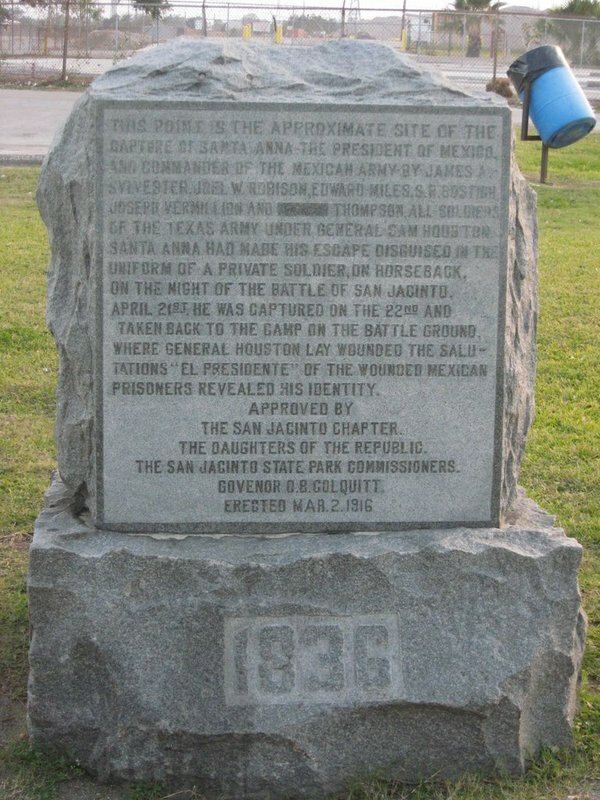 Over the next few days, General Sam Houston ordered a search of the surrounding area to locate any Mexican soldiers who had escaped. The day after the battle, Sergeant J.A. Sylvester and his men, Joel W. Robinson, Joseph D. Vermillion, Alfred H. Miles, and David Cole, found a Mexican private hiding in tall grass near Vince’s Bayou. As Sylvester and his men took their captive back to the Texan camp, they realized he was more than just a common soldier. The captured Mexicans, held in a makeshift stockade, recognized the new prisoner. Many stood at attention while others cried “El Presidente!” With his identity known, Texas soldiers presented Santa Anna to Sam Houston. Surrounding them were members of the Texas Army, yearning to exact revenge on the Mexican President for his atrocities committed against Texans at the Battle of Goliad and at the Battle of the Alamo. 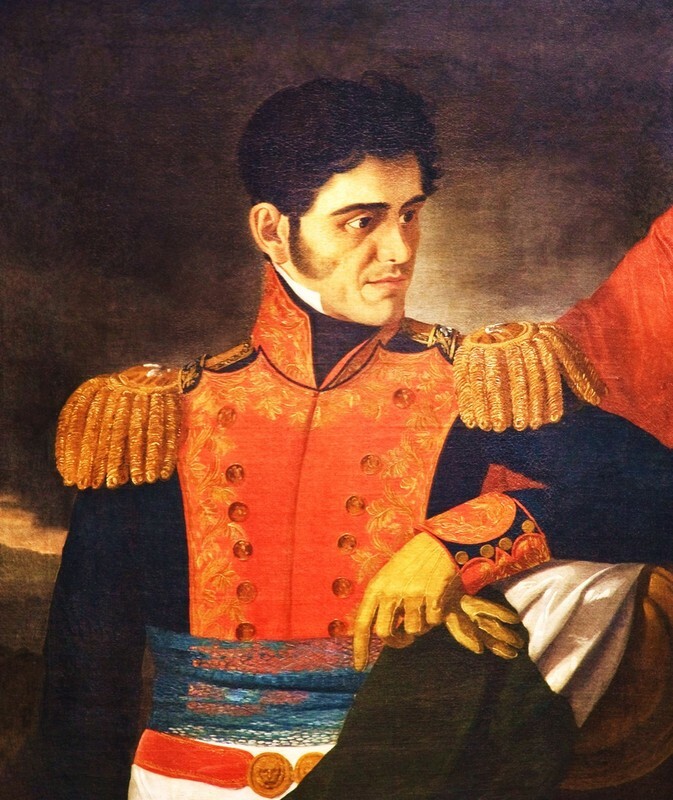 With the aid of a translator, Houston spared Santa Anna’s life – despite his army’s wishes against it – and Santa Anna wrote an order commanding all Mexican armies to return to Mexico effective immediately. 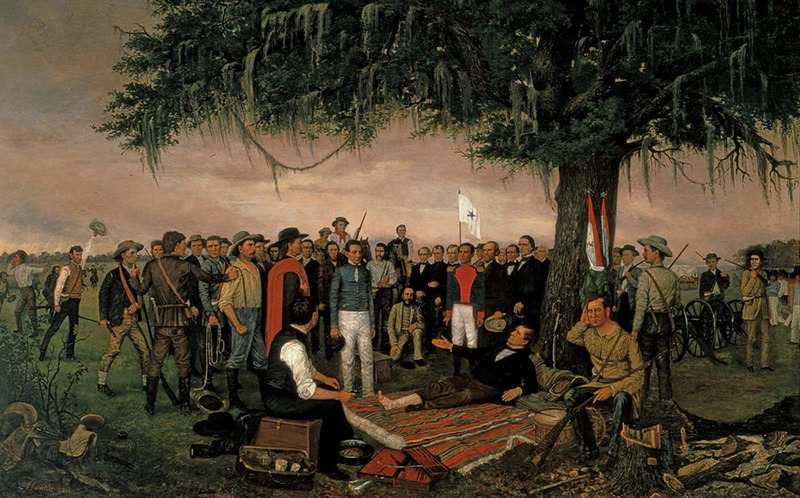 As the next few days progressed, officials from Mexico the new Republic of Texas negotiated the Treaty of Velasco. Texas soldiers took Santa Anna to Velasco so he could sign the treaty, which recognized the independence of Texas. Texas officials then sent Santa Anna back to Mexico via the United States. President and General Lopez de Santa Anna: Santa Anna was the president of Mexico during the Texas Revolution. ~ Source: Antonio López De Santa Anna. N.d. Http://www.sanjacinto-museum.org/The_Battle/Commanders/Santa_Anna/#Pane2,Deer Park. Santa Anna's Saddle: Texas soldiers took Santa Anna's saddle upon his capture. 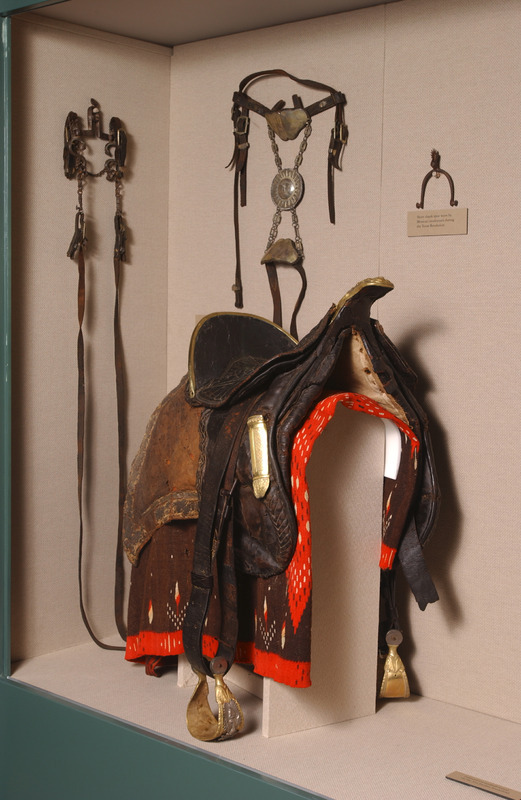 ~ Source: The saddle is on display at the Sam Houston Memorial Museum. 1836 Sam Houston Ave., Huntsville (936-294-1832). Open Tue–Sat 9–4:30, Sun noon–4:30. 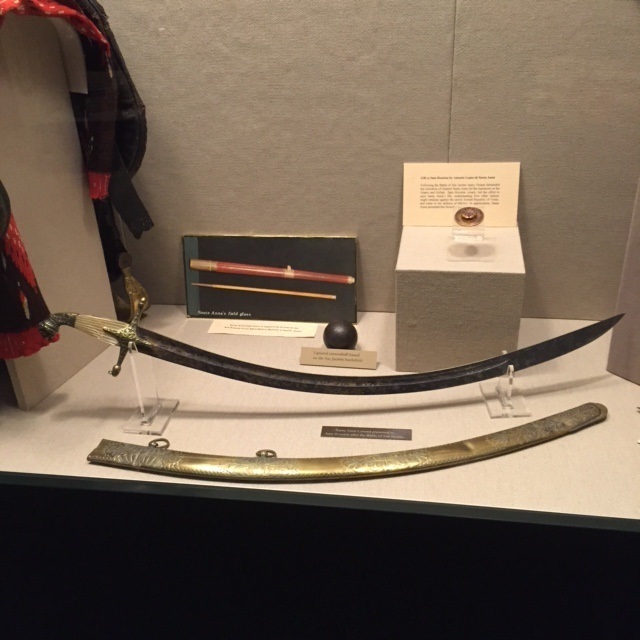 Santa Anna's Sword: Santa Anna's sword was given to Sam Houston as a spoil of war. It is pictured with a brooch given to Houston by Santa Anna, a cannon ball and field glass. ~ Source: On display with the Santa Anna's saddle at the Sam Houston Memorial Museum. 1836 Sam Houston Ave., Huntsville (936-294-1832). Open Tue–Sat 9–4:30, Sun noon–4:30. Leslie Sproat, “Capture site of Santa Anna,” East Texas History, accessed April 21, 2019, https://easttexashistory.org/items/show/142.